Open Competition for U.S. Participation “SHAPING PARTICIPATORY DEMOCRACY” Professional Fellows Program for Albania, Bulgaria, Hungary, Romania, Slovakia, and the United States of America. Organizations and individuals, who are actively involved in the legislative process and/or in policy-making through their work in government, civic education organizations, citizen advocacy groups, community activists, or community organizers working with marginalized or rural communities, are invited to apply for participation as a U.S. host organization and/or as a U.S. mentor. We encourage professionals and their organization to submit their application to take part in an exchange program with matching participants from five Central and Eastern European countries. This program is a two-way exchange opportunity involving professionals and leaders from the U.S. and selected European countries. U.S. mentors will share their professional expertise with the EU fellows of this program and travel for a two-week reciprocal visit to counterpart organizations for consulting. 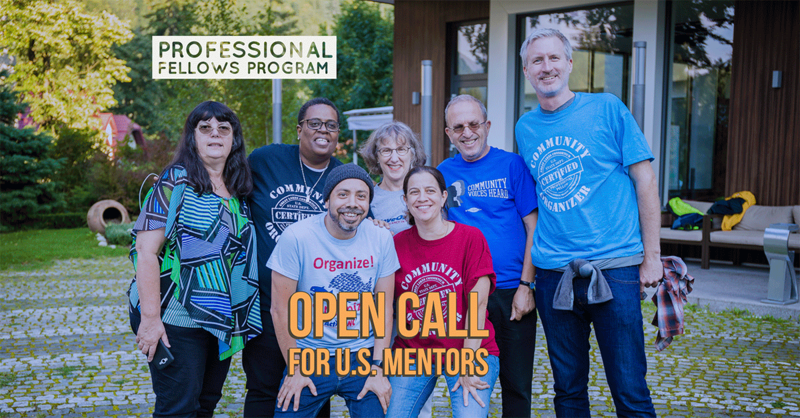 Mentors will conduct joint workshops in order to share experience and to promote mutual understanding and partnership between key professional groups in the United States and groups in the selected European countries. Our goal is that our partners from different parts of the world learn from each other first in the U.S. and in Europe afterwards that will contribute to positive change in both of their communities as a result of this exchange. European participants will be actively involved in organizing the U.S. mentors’ visit to their organization and their country as well as assist in joint trainings with their U.S. mentors and other alumni. We are looking for U.S. organizations that are interested in acting as volunteer hosts for 2-3 incoming professionals for a 4-week internship program at their U.S. workplace. They should be able to provide a professional development opportunity for up-and-coming and mid-level professionals from Central and Eastern Europe and help them learn American methods in shaping participatory democracy in marginalized or rural communities while comparing experiences. Host organizations are also asked to place the guests with volunteer host families where they will learn about American culture and family life and can become involved in volunteer activities in their host family’s own community. U.S. host organizations will work closely with WSOS/ Great Lakes Consortium in planning and implementing the internship program. The program is funded by the U.S. Department of State Bureau of Educational and Cultural Affairs, Office of Citizen Exchanges. The Professional Fellows Program is organized by WSOS Community Action Commission, Inc. – Great Lakes Consortium for International Training and Development (GLC) from Northwest Ohio in collaboration with Co-PLAN in Albania, Creating Effective Grassroots Alternatives Foundation (C.E.G.A) in Bulgaria, Civil College Foundation (CCF) in Hungary, The Resource Center for Public Participation (CeRe) in Romania, and Center for Community Organizing (CKO) in Slovakia and other local partners in the United States of America and in the selected countries in Europe.